* Membership is offered for a Series of Classes. All classes must be pre-registered and fee paid in full (no credit nor installement) prior to attendance to first class. 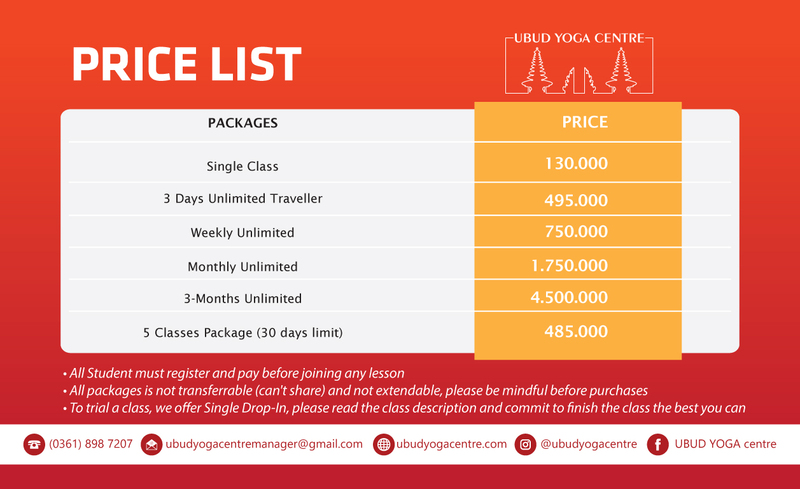 All memberships and class packages have an expiration date and are non-refundable, non-extendable or non-transferable (from one student to another). There are no refunds on the purchase of any class series. We do not offer refunds for missed classes. Class series may not be shared. Class series will not be pro-rated for missed classes. No Refunds are given on any purchases. All sale items are FINAL. PLEASE BRING YOUR OWN PADLOCK. If you are borrowing, there is a fee. Locker’s Key must be returned on the same day. If returned days after, there is Rp 15.000 charge. If lost, there is Rp 35.000 charge. Thank you for adhering to and understanding our need for company policies. We are available to discuss them at anytime with you if needed.